Picanova ‘Top 100 Photography Award’: The Winners Have Been Chosen! 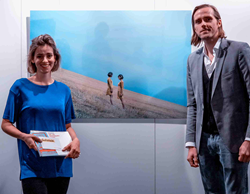 Picanova's managing director Philipp Mühlbauer with the winner Laura Zalenga in front of her photo "Lean on me"
More than 10,000 photos from 15 countries around the world were submitted for the first edition of Picanova's ‘Top 100 Photography Award’ at photokina. The top-class jury has subsequently selected the best 100 pictures and has awarded three main prizes. First place went to “Lean on me” by Laura Zalenga from Munich. Second and third places went to Michael Jaster with “Rosa Flamingo” and Carsten Schröder with “Firefighter” respectively. The award ceremony with Picanova's Managing Director, Philipp Mühlbauer, and Managing Director of Foto Koch, Thomas Görner, took place yesterday in Hall 1 in front of the picture gallery of the ‘Top 100 Photography Award’. “We are overwhelmed by such a large number of participants and are very pleased with the outstanding quality and unique visual language of the entries,” said Philipp Mühlbauer, Managing Director of Picanova. The first, second and third place winners received prizes worth 10,000, 6,000 and 4,000 Euros respectively, half of which can be redeemed at Foto Koch photo shop in Düsseldorf and half at picanova.de. In addition, the winners will receive their own picture sized at 120x80cm as an Alu-Dibond photo print as well as strategic support in setting up their Photo.Club web shop for selling their own motifs. The winners were not the only ones who benefited though. Prizes worth 500,000 Euros were awarded to participants. Laura Zalenga from Munich studied architecture and has been an independent portrait artist since 2014. She impressed the jury with her winning picture “Lean on me” (taken with a Sony α7R II). The photo is part of a project where the artist reinterprets existing pictures from her portfolio. “I am very happy about the first place and the attention my photo gets from the exhibition at photokina. This is a great opportunity to make my photography even better known,” says Zalenga.